After three days of amazing holiday weekend barbecues, I am ready for something without sauce, sides of beans or cool whip desserts. I have had the pleasure of attending festivities at friends’ homes so I actually haven’t had to do much cooking! My crock pot has been sitting pretty for a few days now and I will neglect it no longer– it’s time for a new recipe. I’ve had some requests for more chicken recipes, so today I am presenting you with a classic favorite, plus an alternative way to do it. 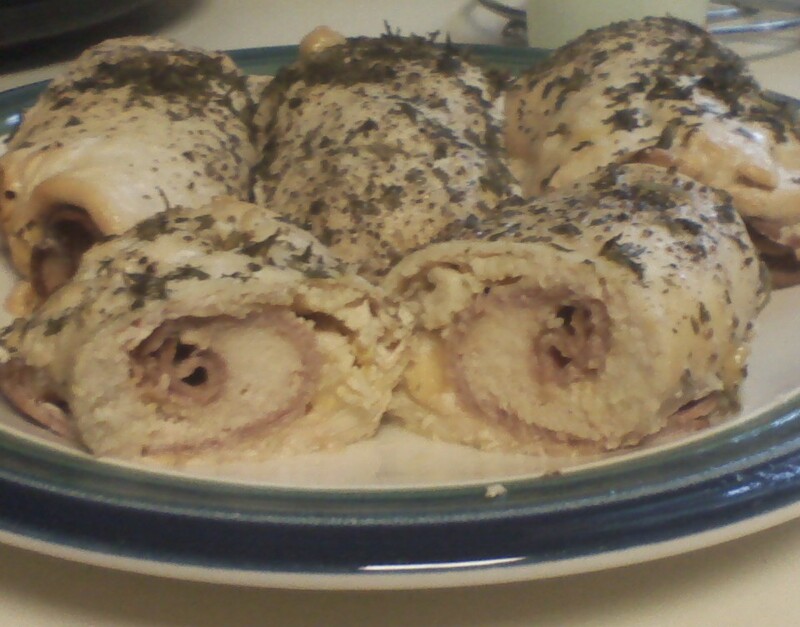 Chicken Cordon Bleu is a popular dish, but I think it’s more American that French cuisine. Stuffed meat isn’t that new of a concept and there is nothing actually blue in this dish. From what I understand, Cordon Bleu actually means “blue ribbon” in French and is an award given to culinary masterpieces. Here in the states, I advocate for using deli ham and swiss cheese in your chicken, but if you’d like to make it more exotic, feel free to try prosciutto and gruyere cheese for more bite. You need to start by venting your frustrations on a piece of meat. Place each boneless/skinless chicken breast in a zipped plastic bag and go to town on it. Use a rolling pin, a mallet, a can of soup… anything that will apply weighted pressure. You want the meat to be tenderized and spread thinner. If you’d like to make this dairy-free/kosher/healthier, try using different filling in your meat. I suggest trying a combination of fresh spinach, sliced mushrooms and roasted garlic instead of ham and swiss in your chicken rolls. You can use all the same directions, just substitute your inner components. Feel free to experiment and find out what earns the “blue ribbon” in your kitchen. Enjoy! Beat chicken into flat, thin pieces. Lay flat and smear with mustard. 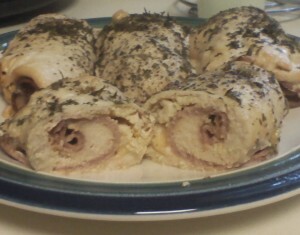 Layer one piece of cheese and one piece of ham, then start at end and begin rolling chicken. Place each roll seam side down in the crock pot. Sprinkle seasonings on chicken rolls, then pour wine into crock pot, but do not rinse the seasonings back off. Cook on low for 4 hours. Remove rolls from pot and let cool for a few minutes so that juices can settle. Serve hot.